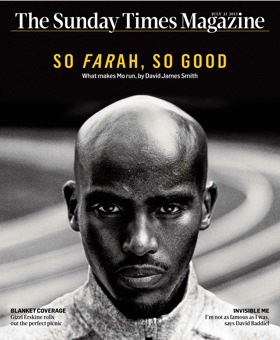 Winning two gold medals, Mo Farah became one of the faces of the London Olympics. Yet much of his life — and background — remains shrouded in mystery. David James Smith finds out what makes him run. A young stowaway met his death when he dropped out of a plane in the skies above Heathrow. What made him embark on such a risky journey? David James Smith unravels a surprising tale of love and loss. Age and failing health are bringing Nelson Mandela to the end of his life. As he retreats from the world, his family is locked into an unseemly battle over his legacy — and stands accused of exploiting his name. David James Smith investigates.